Every once in a while you stumble across something so brilliant you want to shout it from the rooftops! 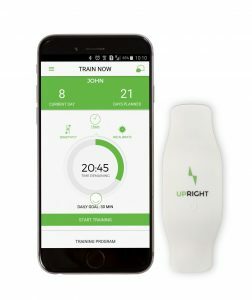 This is the exact case for this posture product review of the new software Brightday (currently available through a Kickstarter Campaign only). As a posture fitness specialist, I’m not a huge fan of posture braces. When a brace is holding your body in position, it trains the “brain” to sit in better posture, but the muscles are still being assisted by the brace. I’m a bigger fan of products that force you to find movement and proper alignment using your own body mechanics and musculature. For example, I reviewed a product a while ago called “Upright Go”, which is a device that sits on the upper spine, tracks alignment, and buzzes you when you fall out the position. You set “training” sessions throughout your day to practice sitting in “proper posture”, because wearing it all day long doesn’t make sense (if you bend over to pick up your bag you would be buzzed). Now in theory, this product is brilliant, but in reality there are some downfalls. Do you know what happened to my upright go? I wore it home one day (accidentally) and took it off, and kept forgetting to charge it and take it back to my workstation. The “forgot to put it on and charge it” element of the posture device, leaves more than desired when it comes to ease and effort. 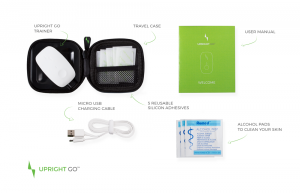 Now along comes Brightday, billed as posture software with no straps or gadgets. At first glance, my thought was “I don’t want to have to download something new that may or may not work”. But, when I realized it was compatible across many devices and platforms, and that I could program it to open at a particular time of day that worked for me, I was in. The download to my HP laptop was easy. The set up took less than 5 minutes. Figuring out how to use it was a breeze. With a posture wearable device, you are forced to reach around and awkwardly place it on your back to put it on, and then to press a button to “calibrate” it for your proper posture. 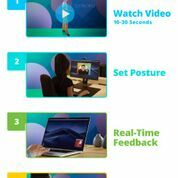 Instead, Brightday software showed me a video of how to sit properly, asked me to find this position, and then recorded my position using the camera on my own laptop. Much like the other wearable posture devices, I then set a “training” session for myself. I sat in the correct position and noticed that when I started to slouch, the indicator on my screen turned a different color. So, I immediately correct myself! By the end of my 10 minute training session I received a notification letting me know what percentage of the time I was in “proper posture”. I’m not the posture coach who will tell you that you should be sitting in the same position all day long. In fact, I believe the exact opposite of this. I believe that movement is key and immobility is killing us (I actually just launched a coaching program that ensures movement and posture positive exercises at your workstation). HOWEVER, I do believe in what Brightday offers because it is important to build the awareness around what is “good” posture. These muscles need training. The mind controls the body and the mind needs re”minding”. This software is currently on Kickstarter, and I urge you to support this amazing endeavor. It’s bound to instantly provide value for you (especially since a year subscription only costs $49 for 1 user, with additional discounts for family and small office packages). 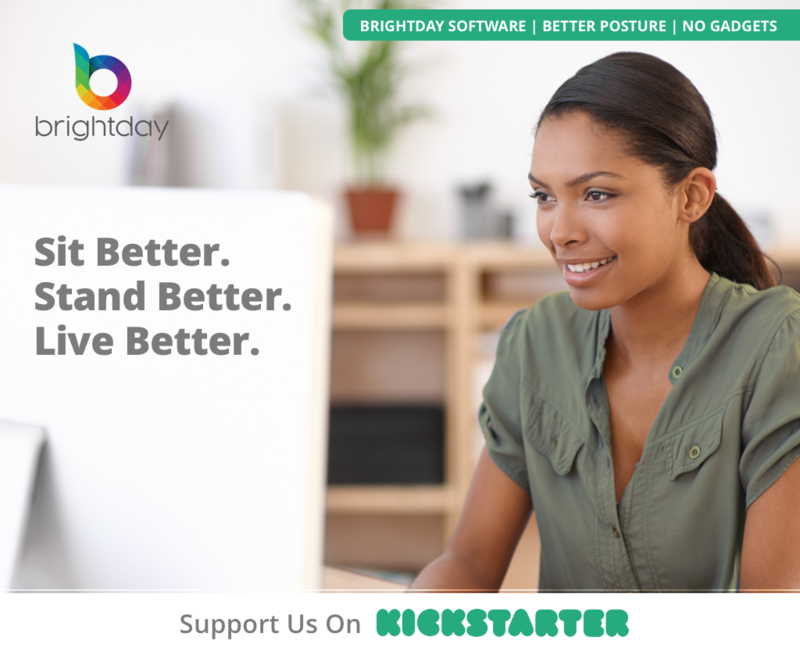 Brightday will “kickstart” you into better posture and without all that crazy posture pain, you are bound to have brighter days ahead! Proper posture gets a lot of attention in the world of sports, as poor body alignment can cause serious consequences in training or during a game. However, it doesn’t come naturally for many people especially with the nature of most jobs, and even athletes need some help. 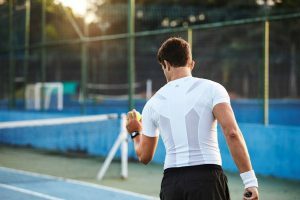 One exciting innovation that sports scientists have made are posture-correcting shirts that can improve sports performance. A term coined by chiropractor Dean Fishman, ‘text neck’ is the pain felt in the cervical spine after slouching too much from looking at a mobile device. The human head weighs 10 pounds on average, but can feel as if it weighs up to 60 pounds depending on the angle of the neck when it is bent. This puts a lot of strain on the spine especially on the neck and the upper back. Bad posture is an occupational hazard for athletes. They can also suffer from the syndrome, especially with lots of hours spent on the road and reviewing their performance on tape. Aside from these sedentary habits, Very Well Health adds that muscle imbalance, fatigue, and injuries lead to improper posture. Muscle spasms, for example, tend to weaken the damaged area over time, throwing the body out of symmetry. On the other hand, some athletes have a tendency to overwork the side of the body that they use the most and neglect the other—like a quarterback’s throwing arm. It can also put the alignment out of whack. Posture shirts are not your average compression shirt as they’re considered medical devices. One of the more known brands is AlignMed which many athletes are starting to use. They include Kansas City Royals pitcher Greg Holland, and Washington Wizards center Dwight Howard, who uses it under his jersey. Although it is still a compression shirt, the AlignMed posture shirt is fitted with ‘neurobands’ that activate the muscle groups around the spine, particularly around the shoulders. When the neuroband technology senses even the slightest rounding of the back, it stimulates the muscles so that you can snap right back to proper posture. It’s similar to the wearable device Upright GO which we previously raved about here on VerticAlign. Posture shirts don’t do all the work but give you a literal tap on your shoulder (or your upper back) when your body is out of alignment. Aside from AlignMed’s posture shirt, other products have started popping up on the market as well. Underworks came up with their own version of the technology as well, with an additional band in the midsection to contract the abdominals. Other sports teams and players have also looked into posture correcting technology by adding modifications to their apparel. In their article on the evolution of professional soccer kits, Coral details how Italy’s World Cup 2014 shirt had a special tape in the fabric that micro-massaged players. Its purpose was to speed up recovery and prevent muscle fatigue. This process helps avoid alignment issues. Posture is extremely important in sports especially in terms of improving circulation, reducing pain, preventing injuries, and enhancing athletic performance. Right now, the science behind posture shirts still needs to be studied, especially its long term efficacy. However, testimonials from professionals look promising so it may not be a bad idea to invest in posture-correcting apparel. 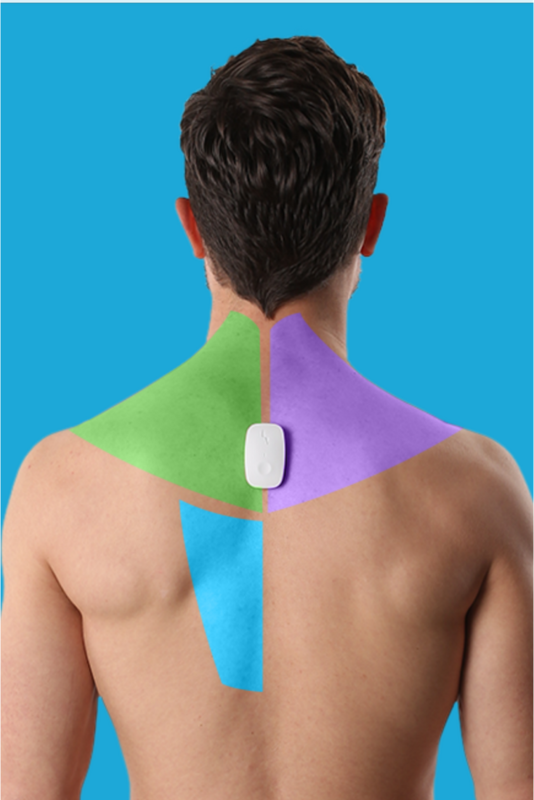 Stay tuned for VerticAlign’s in-depth discussion of different posture correcting wearables. More products with such feature are still coming out on the market and they need to be put to the test!